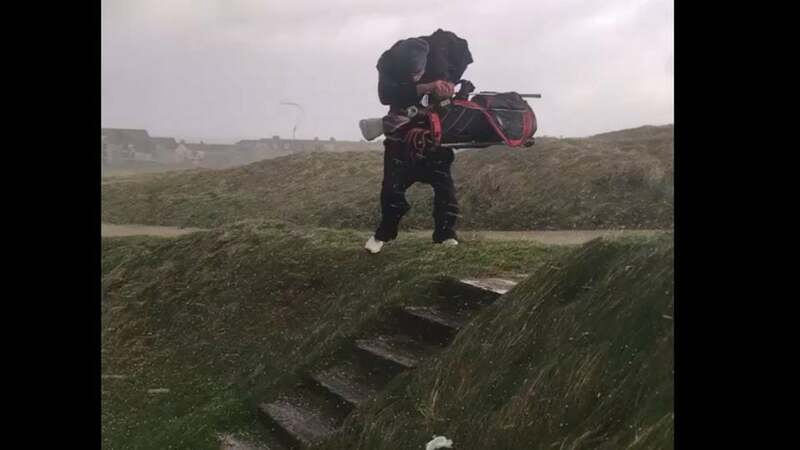 A golfer battles high winds and hail at Newquay Golf Club in Newquay, Cornwall. Golfers trying to enjoy wintertime rounds often must put up with difficult weather conditions in order to scratch their linksy itch, but a few English golfers took idea that to a whole other level just a couple days before the New Year. Revelers in Cornwall, England had been warned of high winds and potential hail storms during the week between Christmas and New Years, with gusts on the coast potentially reaching 80 mph (hurricane-force winds are defined as sustained or frequent gusts greater than 74 mph according to the Saffir-Simpson Hurricane Wind Scale preferred by American weather authorities). That didn't stop a few golfers from taking their chances at Newquay Golf Club in Newquay, Cornwall. At some point during their round, the golfers were met (surprise, surprise) by hail and hurricane-force winds. Fortunately for the rest of us, one participant risked destroying his phone to capture his playing partner struggling to find cover during a particularly intense moment in the storm. Check it out for yourself below.